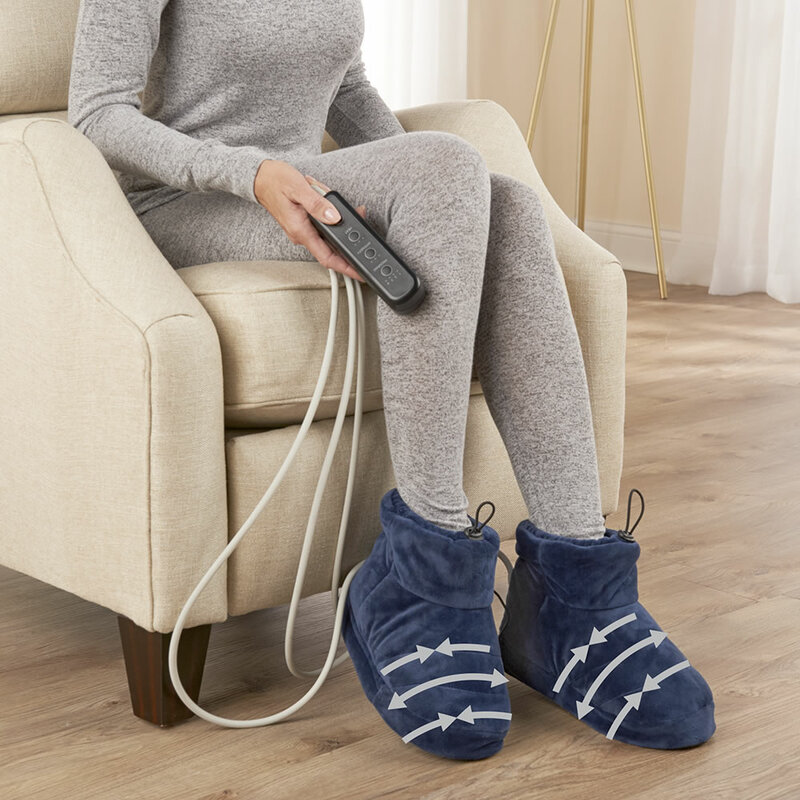 Available only from Hammacher Schlemmer, these are the booties with built-in compression, vibration massage, and heat for a soothing and therapeutic foot treatment in the comfort of home. After sliding feet into the plush fleece interiors, one can choose from three pre-programmed air massaging modes with three intensity levels. The temperature can be set to low, medium or high. The combination of the three techniques relaxes tight muscles and boosts circulation, bringing relief to feet worn out by a long commute or rigorous hike. In a report from The Hammacher Schlemmer Institute, panelists reported on the excellence of the massage, commenting specifically on its firmness and the complement of the heat function. Convenient tethered remote; automatically shuts off after 15 minutes. Not recommended for use by diabetics. Consult doctor before use. AC plug with 9' cord. Accommodates feet up to men’s size 12. The Massaging Heated Therapy Booties come with The Hammacher Schlemmer Lifetime Guarantee. Items that we sell are guaranteed for their normal life under standard non-commercial use.